Does the grid in superstar follow the starting location of a prop? Specifically, I have an RGB prop built from a “Tree 360 wedges” shape with a starting location of “Bottom Left CCW”. When I insert a superstar effect for this prop, it appears that the leftmost column of the superstar grid is the 12 o’clock position when looking down on the prop. Is there any way to associate the left most column of the superstar grid with the 9 o’clock position? If you are using S4 and you have imported a visualization then the first string should be the same as you defined it in the visualization. 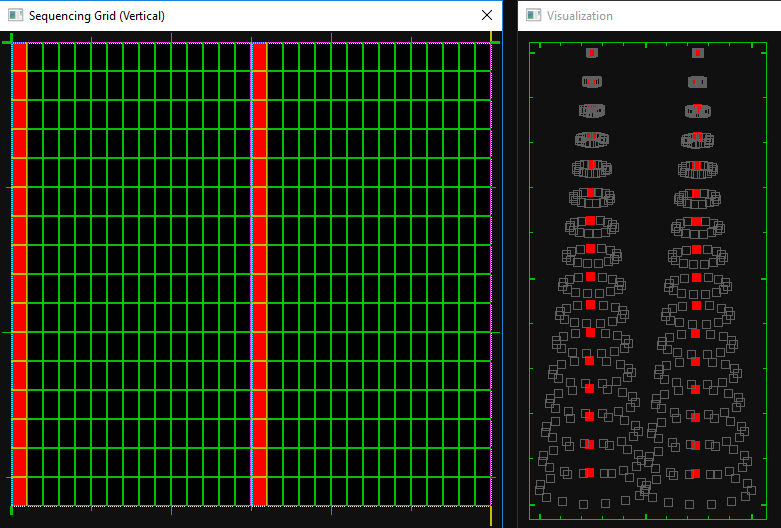 If it is not behaving that we, attach the visualization file and I will take a look at it. If you are using S4 ﻿and you have imported a visualization then the first string should be the same as you defined it in the visualization. I am using S5 not S4. Will that make a difference? Thanks for the video links. Your videos have given me much more insight into the relationship between S5 and Superstar. I still, however, have a question on the Superstar grid and the starting location of a prop. I have attached a couple of screenshots from my setup to help explain my question. It seems as if the first column in the Superstar grid for Prop#1 above is not displayed on the prop correctly. I would have thought it would be showing the string associated with the starting location of the prop. I'm trying to determine if this an issue or not. Thanks for sending the .loredit file it made this issue easier to understand. Your pictures show what is going on, but they are a little blurry so I didn't catch it as quick. 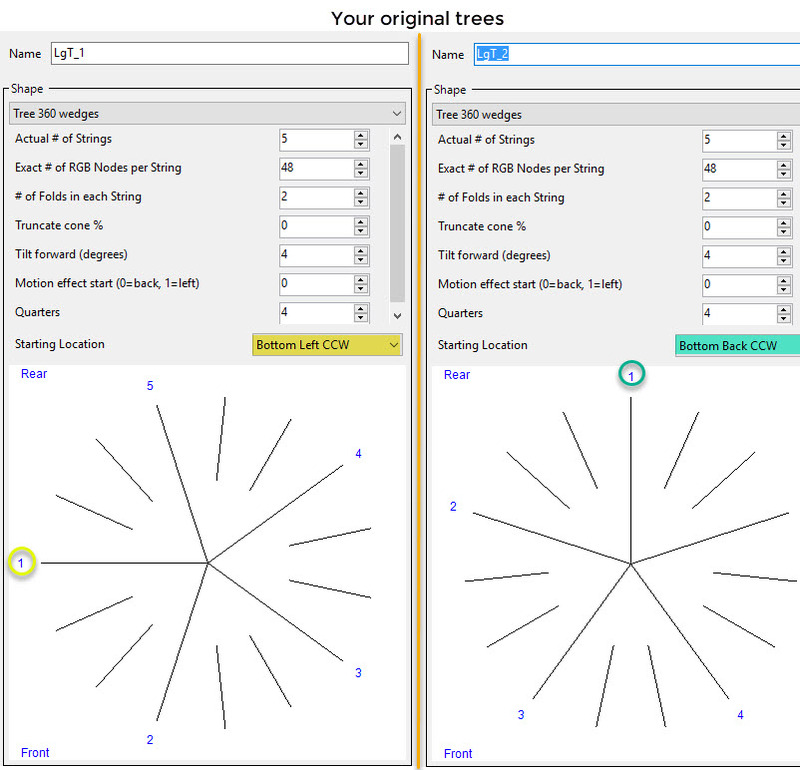 Both trees worked the same, if the 2 starting points being different are whats bothering you, change them both to be the same. 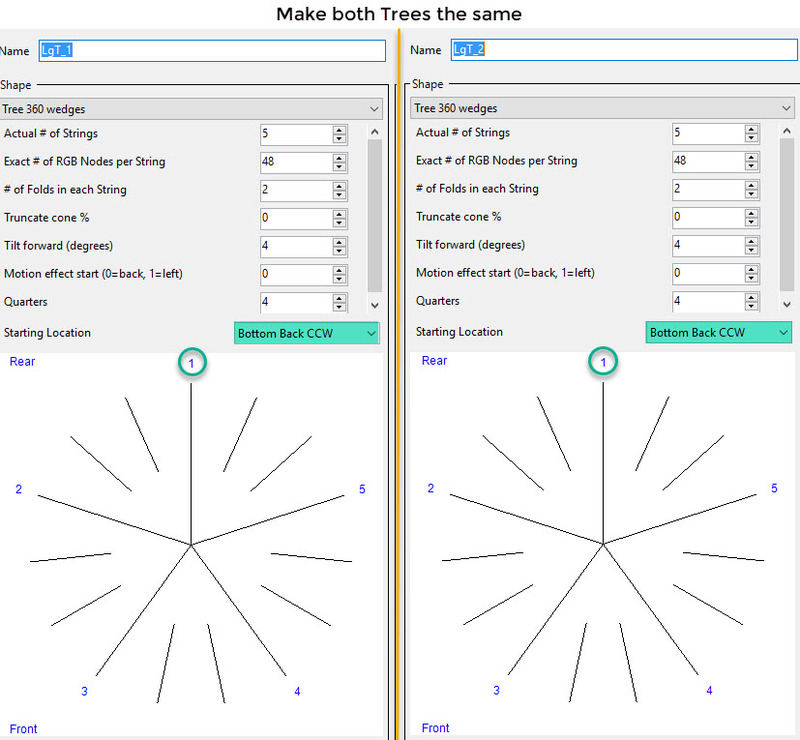 It seems your 2 trees are setup differently in respects to where you have your starting point in tree1 vs tree2. See the gif below. Thanks for taking a look. The part that is still bothering me is what is displayed when the first column in Superstar is selected for the prop configured with a Bottom Left CCW starting position. It just seems like the display shows a string that it is more towards the rear of the tree than the one on the left side. Perhaps I am missing something here. I am not understanding what you are explaining. I created a Group of both of your trees, then appiled a SS Scene Mode effect to the that group. The picture belows from SS, shows that the starting pixels look like they are in the place they should be. This is probably just my misunderstanding of the software. I haven't had time to test against real hardware to see if there is a real issue. In S5 when you specify the "Starting Location" as "Bottom Left CCW" it means the starting location of the addressing of the strings. The starting location of the sequencing grid is in "Motion effect start (0=back, 1=left)" In your case you have it set to "0" so it is starting the sequencing grid in the back. Change the setting to "1" to make it start on the left. Note that this setting effects the sequencing grid for superstar and for the motion effects that are generated by the S5 sequencer.